We left Galway and drove north into the Connemara. 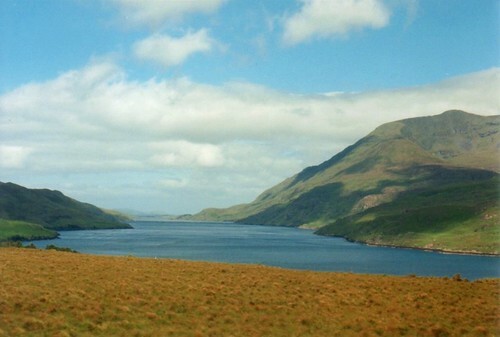 The Connemara region of western Ireland has spectacular scenic views, with rolling hills and deep lakes. 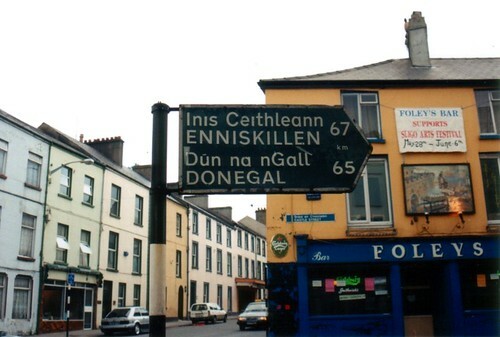 This area is also home to the largest Irish-speaking population in the country. I spent the trip staring out the window at the awesome scenery. 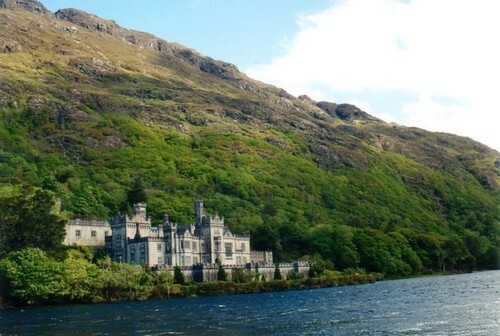 Our next stop was the amazing Kylemore Abbey, which sits alongside a lake and is nestled under several huge hills. Construction on the Abbey ended in 1868, and it was built as the private home for an English politician from Manchester who was the MP for Galway County. 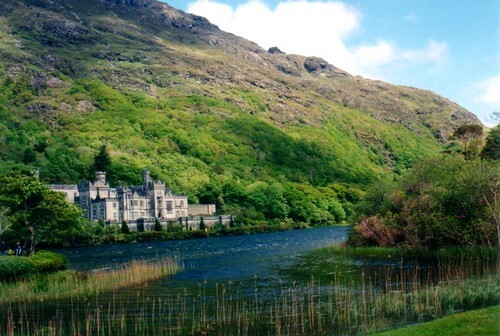 After his wife died, he sold what was then called Kylemore Castle to a group of Benedectine monks who were escaping Belgium during World War I. The Abbey now serves as a monastery and a girl's boarding school. 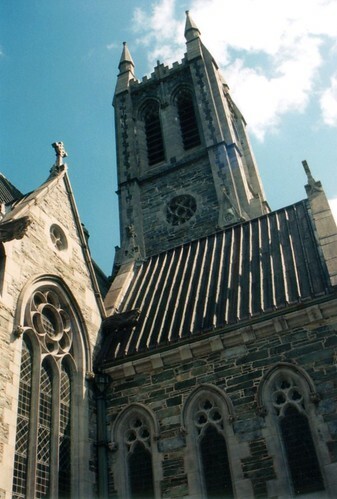 Another feature of the Abbey is the neo-Gothic church, built between 1887 and 1881. 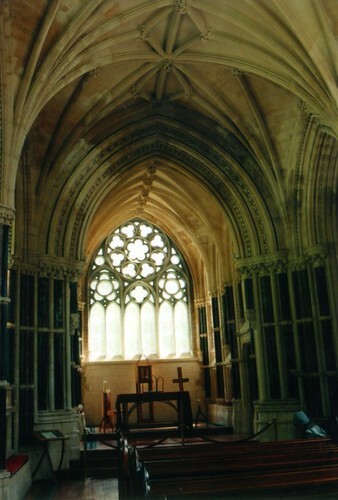 The church is a replica of the Norwich Cathedral in England. 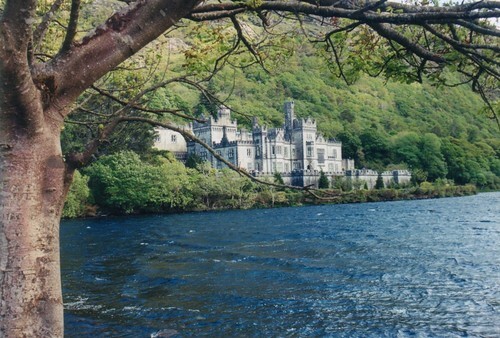 Kylemore Abbey is an awesome place, I can't imagine what it must be like to attend school there. As we were driving away from the Abbey, the driver stopped the bus in the middle of the road. He said we were at a pretty spot, and if anyone with a camera would hurry, they could get a quick shot. So I quickly made my way to the front of the bus and got this shot through the windshield. 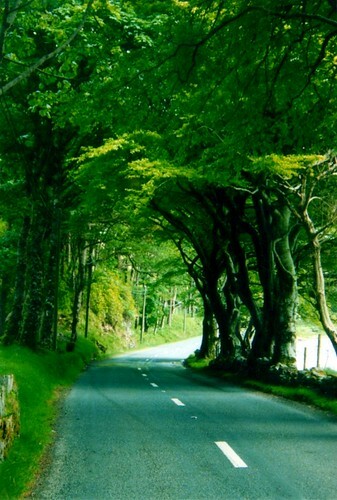 After that we drove further north to the city of Sligo. We made the short drive over to the Drumcliffe graveyard, which is the final resting place for the Irish poet William Butler Yeats. While we were there, another large tour bus pulled up. The tourists emptied out of the bus and walked around the cemetery. "Where are we now?" one of them said loudly. "At the grave of W.B. Yeats," came back the answer. The same person said, "Who is that," and when she was told it was a famous poet, she just turned around and walked back to the bus. How rude, I thought. 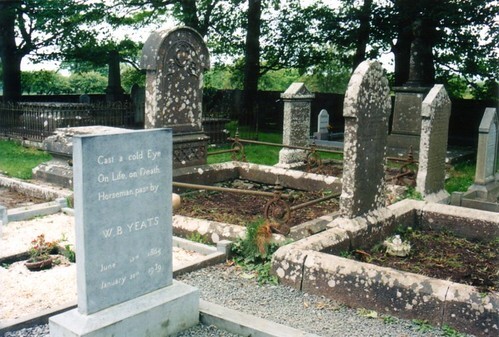 Even if you weren't familiar with who Yeats was (our class had at least read some of his work before the trip), you should show some respect to the cemetery, at least. 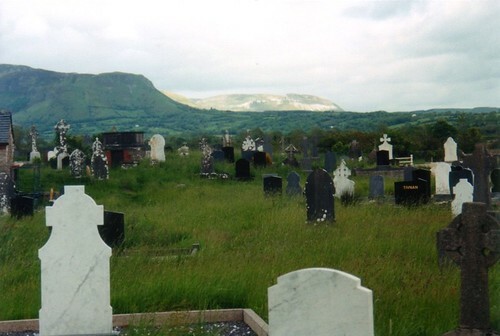 It is a pretty little cemetery, overlooked by the nearby Ben Bulban Mountain. There was even a neat old church and high cross there, too. 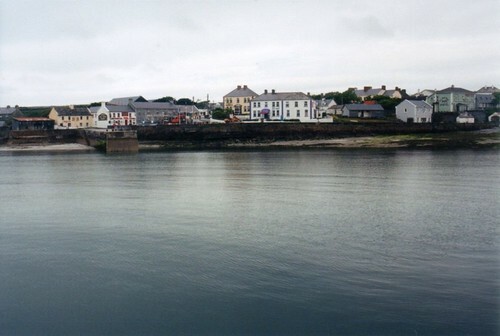 From there we headed on to Rosses Point, a peninsula in the Atlantic Ocean where William Butler Yeats and his brother spent their summers. It was another scenic spot. We went back into Sligo so we could get some dinner. 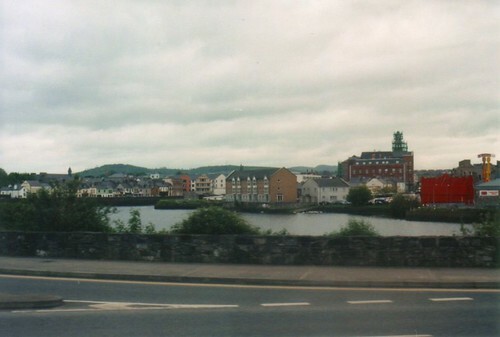 Sligo is also a neat little town. 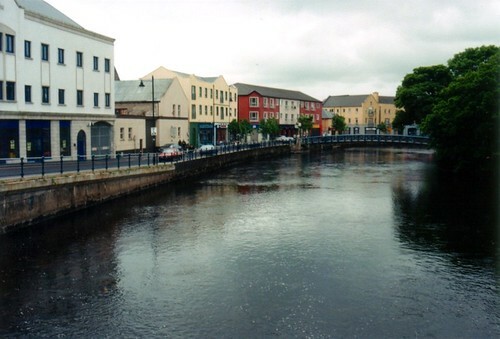 Sligo's name comes from the Irish Sligeach,meaning "shelly place" because of the large number of shellfish found in the river and estuary. A castle was built here in 1245, but the town was often attacked and burned during the medieval period. 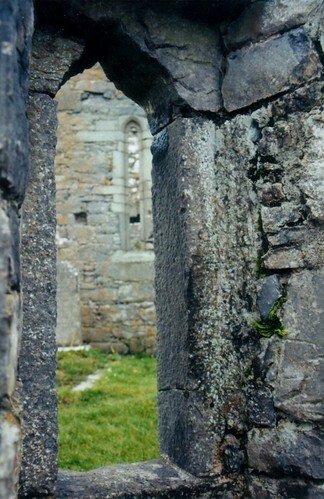 The only medieval building left in Sligo is Sligo Abbey (which we didn't get to see). Bram Stoker's mother was from Sligo, and it's said that ghost stories he heard about the Sligo Abbey were the inspiration for Dracula. 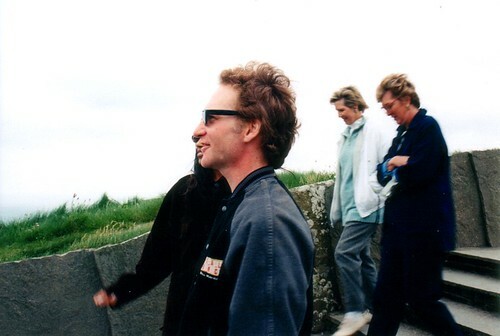 It was one of our last days in Ireland, and we spent the night at a bed and breakfast. 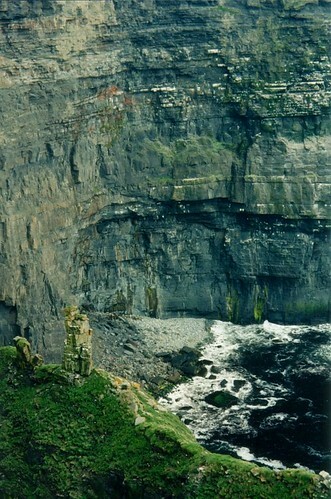 We left Sligo early that morning, and then drove across Ireland to Dublin. I was amazed that we drove all the way across an entire country in just a few hours. 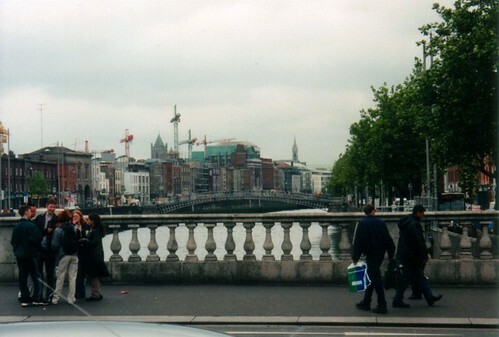 But we had the entire afternoon as free time, where we could visit any sights in Dublin that we wanted to. 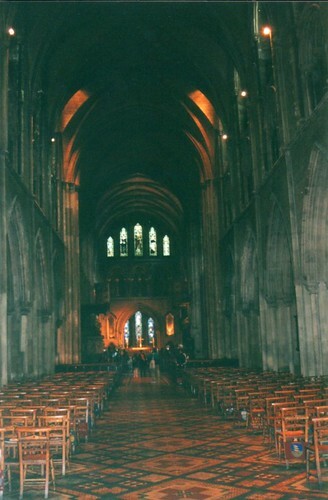 Our first stop was St. Patrick's Cathedral - the largest church in Ireland. 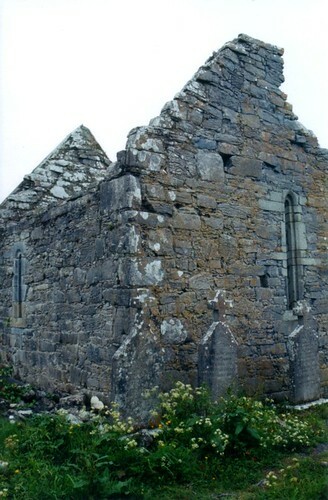 The church is built near a well that St. Patrick used to baptise converts, and the the current cathedral was built between 1200 and 1270. 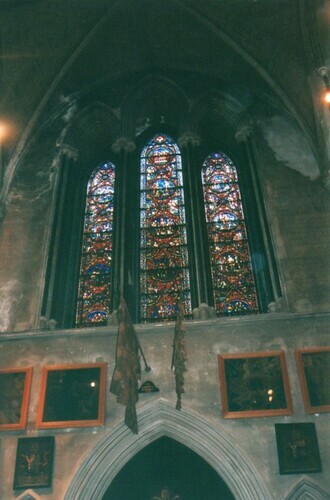 When Oliver Cromwell was in Dublin, he stabled his horses in the nave of the cathedral. 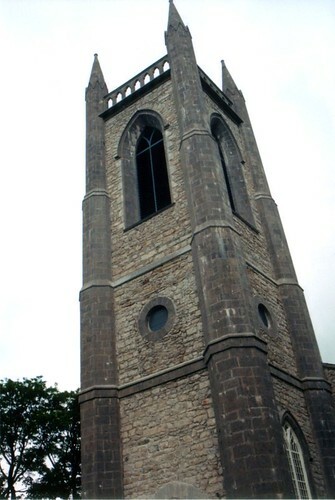 The church underwent a major renovation in the 1860's, funded by the Guinness family. 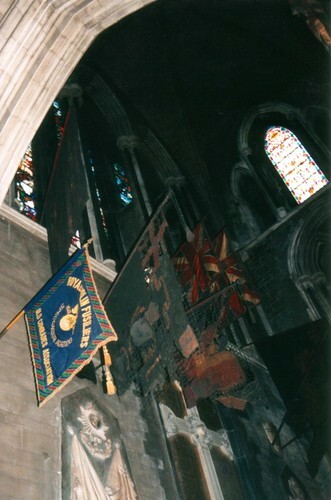 Hanging above the pews are hundred of flags, which were carried by Irish troops during battles. 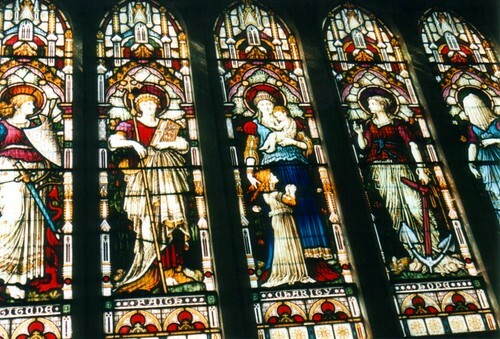 There are a lot intricately designed stained glass windows in the cathedral. 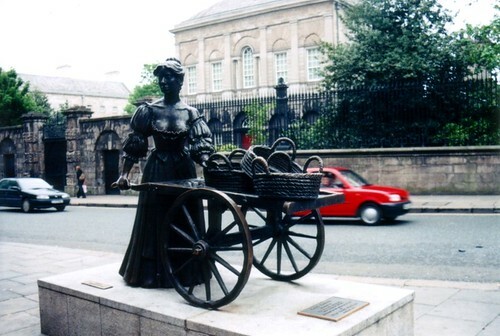 Dubliners have given the many statues in their fair city some nicknames, and this statue of Molly Malone is referred to as the "tart with the cart." 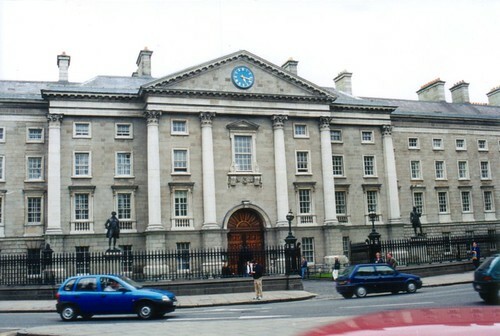 At College Green, near the front entrance to Trinity College, sits this view. 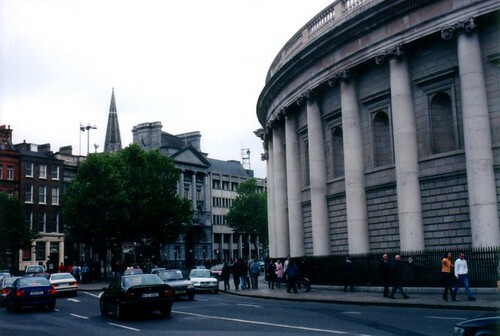 On the right is the Bank of Ireland building, which served as Ireland's Parliament House until 1800. 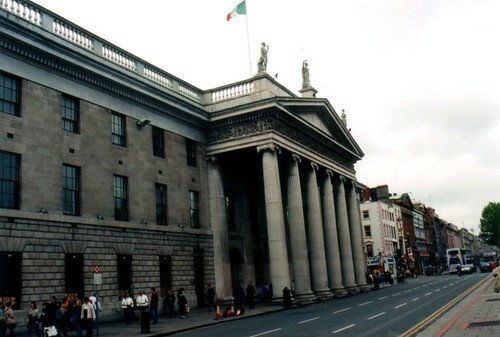 We walked by the General Post Office, the sight of the 1916 Easter Rising. 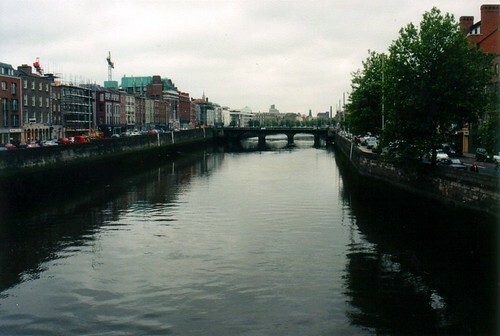 It was from here that Patrick Pearse read out the Proclamation of the Republic, which proclaimed independence from England. 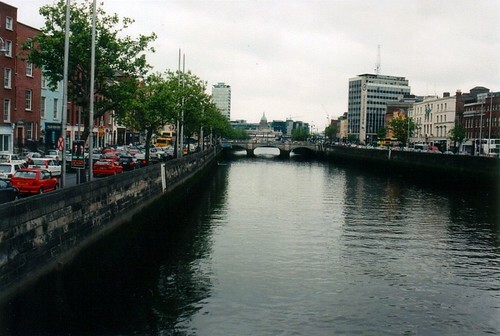 The rising was suppressed seven days later, after the English began to bombard the area around the GPO. 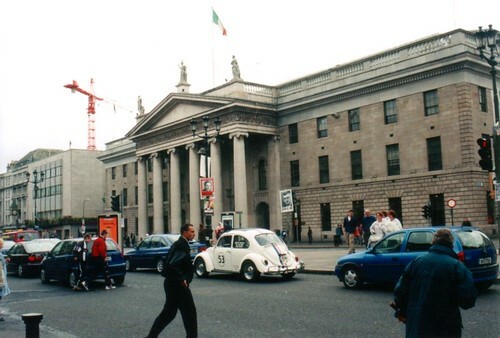 Fires caused by the shelling caused the Irish rebels to dig tunnels from the GPO and through neighboring buildings. On April 29,1916, the rebels surrendered. 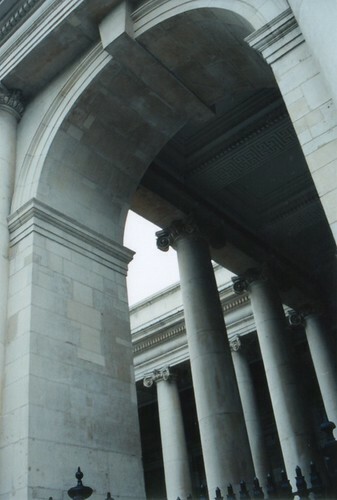 The GPO was heavily damaged during the rising, and you can still see bullet holes on the columns along the front of the building. 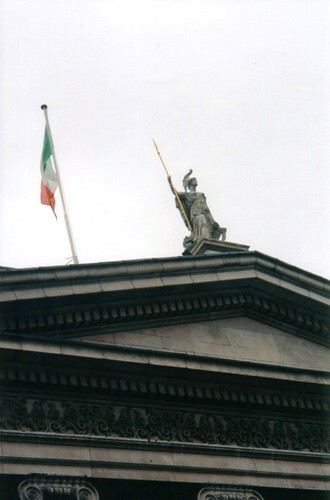 But the Easter Rising brought about a growing desire for Irish Independence, and the Anglo-Irish treaty of 1920 divided Ireland into the Republic of Ireland and Northern Ireland. Outside of the GPO sat the Anna Livia fountain, which was meant to personify the River Liffey. 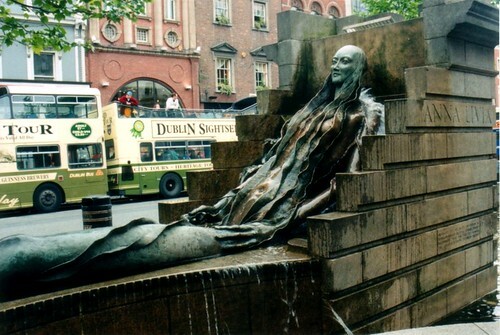 Dubliners loving named this statue the "Floozie in the Jacuzzi." 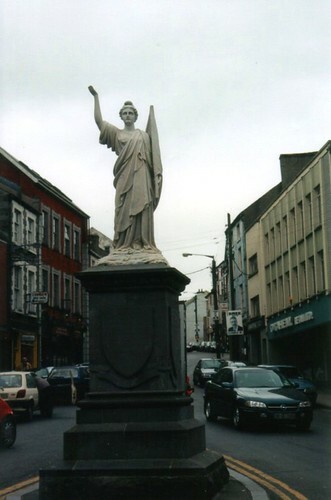 This statue sat on the spot of Nelson's Pillar, which was built in 1809. The pillar included a statue of Lord Nelson that was similar to the statue in London's Trafalgar Square. 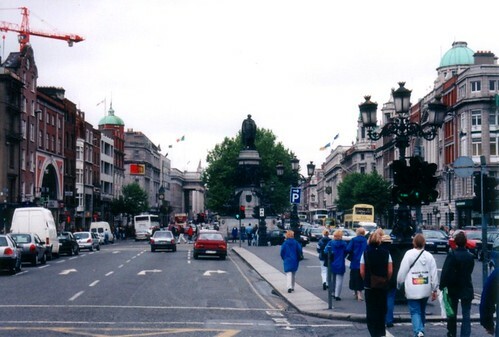 In 1966, an IRA bomb destroyed the statue and damaged the pillar, and it was taken down. 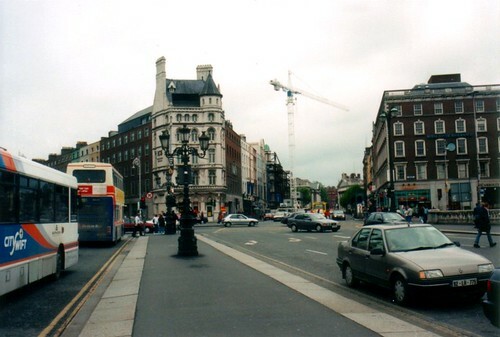 The Anna Livia fountain was built in 1988, and moved in 2003 to make way for the Dublin Spire. 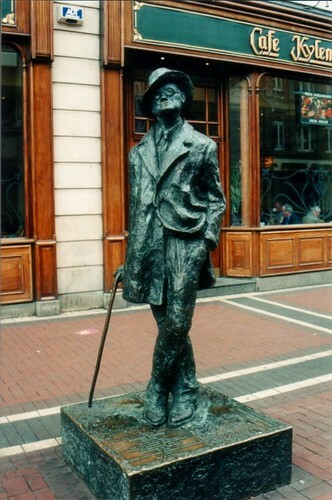 Walking down O'Connell Street we passed by this statue of James Joyce, which Dubliners lovingly refer to as "the prick with the stick." Then we had one of the most bizarre encounters of the trip. We hadn't had lunch yet, and looked for someplace to get a quick bite to eat. We were right next to a Burger King, and we reluctantly went in (none us really wanted to travel abroad and then eat at an American fast food place). But I'm glad we did. We all stood in line, trying to figure out what to get. Someone in line ahead of us looked a bit familiar. After he walked past, we tried to figure out who it was. One of us remembered where we had seen him before - he was the guy who played Frank Fontana on Murphy Brown! We debated back and forth on whether or not it really was him or not. Some other Americans were behind us in line and overheard us talking, and they said they thought it was him as well. I was the last one in line, and while I waited for my food, my friends walked over to talk to Frank Fontana, whose real name is Joe Regalbuto. They said that they were just able to ask, "excuse me, are you.." before he cut them off and said that yes he was. They said he was nice and signed some autographs. I was a bit dissapointed that they did this while I was waiting to get my food. But we sat down and started to eat, across the dining area from the table where Joe Regalbuto was sitting with three other people. As we finished our meals, we kept on trying to discreetly look over at the table with the famous person at it. There was another person there who also looked familiar. Who was that? Then suddenly it dawned on us, that person looks like Steven Spielberg! 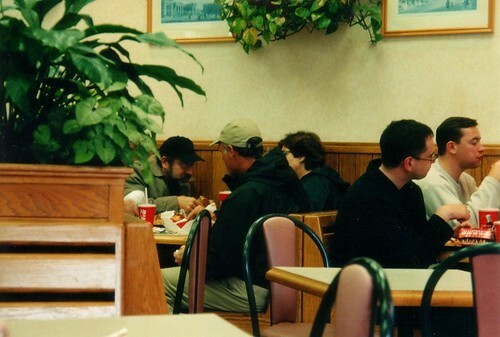 No way, I thought, what would he be doing at a Buger King of all places? There was a security guard walking around, talking importantly into a walkie-talkie. So we asked him, "excuse me, is that Steven Spielberg sitting over there?" And he answered simply, "why yes, it is." Holy crap! I took the camera out and tried to get a shot without anyone noticing. I feel bad since I felt like a paparrazi. But I didn't think anyone would believe me without any proof of the encounter. When they had finished eating, we decided to go and have a quick chat with them. Steven Spielberg didn't seem like he wanted to be recognized, so he didn't say much. But one of my friends said that he really liked Schiendler's List, which made Speilberg look up and smile, and say thanks. I tried to say something but I was nervous and ended up mumbling something incoherent that probably made me look like a crazy person. We went off and let them enjoy the last of their fries in peace. We were running out of time though. 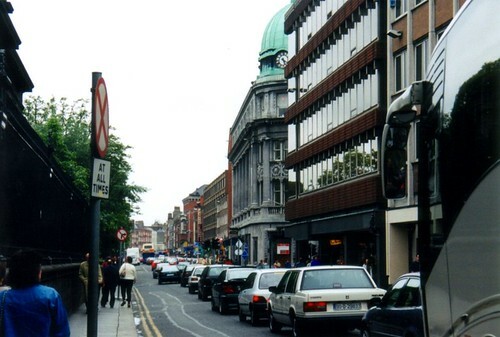 We had to meet back up with the bus soon, but I rushed into a sporting goods store along O'Connell street to do some last minute shopping. At the pub earlier on the trip, I saw someone wearing what I thought was the jersey for Dublin's soccer team. I hurried and tried to find it in the store, and quickly purchased one. I later found out that it wasn't a soccer jersey but was instead the jersey for Dublin's Gaelic Football team. Oh well, it's a pretty cool looking jersey anyways. Now we were really pressed for time. 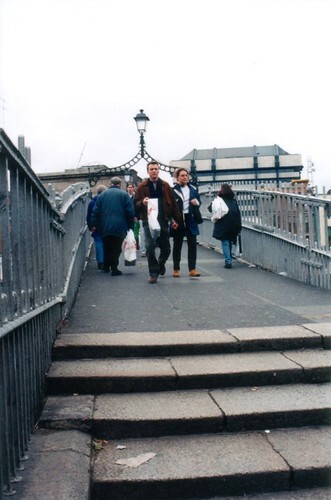 But we wanted to go out and see the Ha'penny Bridge, which crosses the River Liffey. We ran down the road and up to the bridge. The bus was waiting at the college, and I got this one last shot before getting on board. On the bus we proceeded to tell the rest of the class about our celebrity sightings. The bus driver tried to interupt so he could give out some facts about Dublin while he was driving around. But by the end of our story, he was anxious to share his celebrity sighting of the day. He said he went to a pub for lunch, and sat down right next to Tom Selleck. He said that the two of them had a nice talk while they ate their lunches. We left Tralee in the morning and drove to the Dingle Peninsula, one of the prettiest places in all of Ireland, and one of the most scenic places I’ve ever visited. 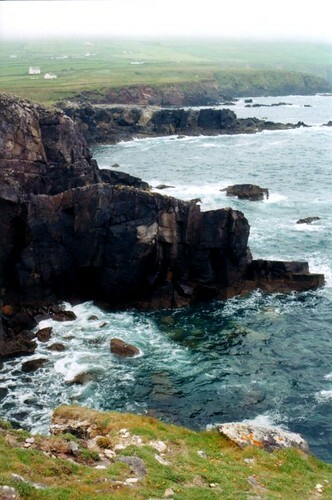 The peninsula sits in the southwestern corner of Ireland, and is just about as far west as you can go in Europe. 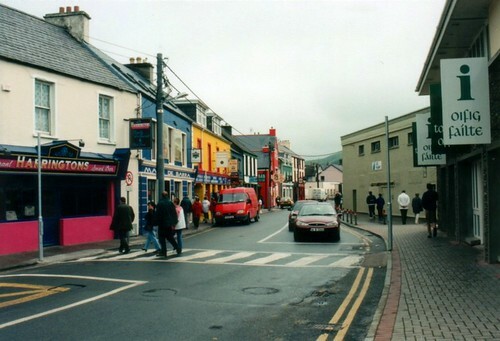 We started our visit with a quick trip to the quaint and picturesque town of Dingle. 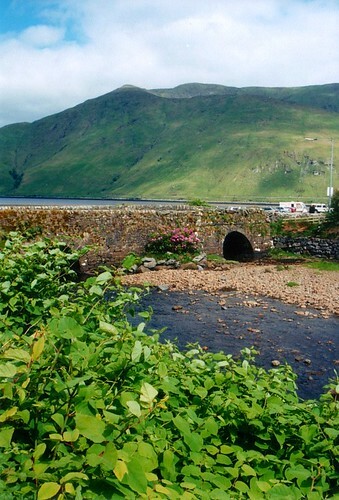 From the village, the tour bus set out on the old and narrow roads along the peninsula. The roads weren’t really built with tour buses in mind, so it gets a little crowded there. 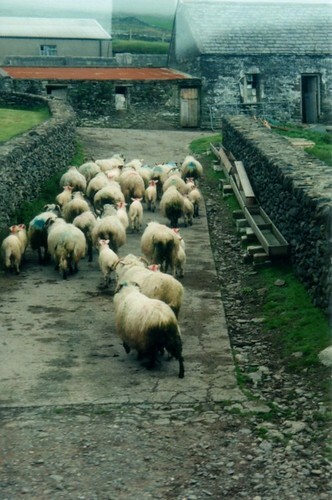 Tour busses like ours got stuck behind this kind of traffic - herds of sheep getting moved from one field to another. The scenery out there was amazing. 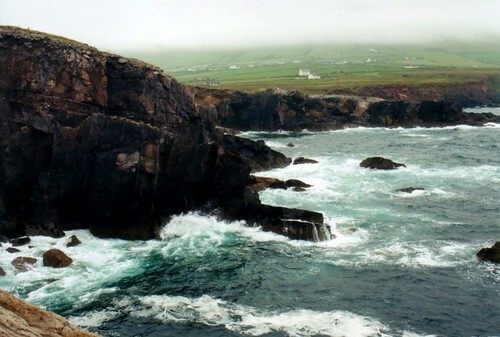 Rolling hills of the deepest green dropped down into the Atlantic Ocean, while low clouds skirted overhead. This was taken from an overlook, while a light rain fell. A few in our group weren’t happy with the weather, but I loved it. It just seemed like the weather went perfectly well with the landscape. Or I’m just weird and like rainy weather. We drove by the house owned by the lead singer of the Cranberries, and then ended up at a visitor center. It seemed like most of our group went there to take shelter from the weather, but a few of us headed out to enjoy the view. Before this trip, I always thought that the expression of something 'taking your breath away' was just a cliché. 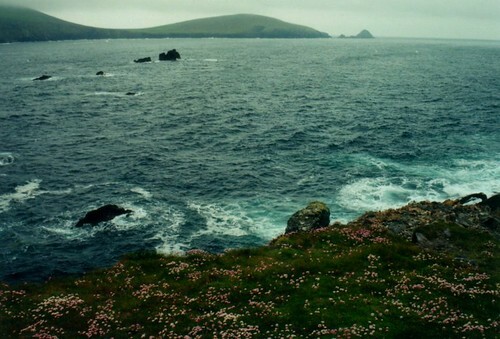 But as I stood on the edge of the cliff, the view did indeed take my breath away. I was standing high above the crashing waves of the Atlantic Ocean, surrounded by hills that had a layer of fog that resembled the icing on a cake. I’m lucky that I’ve been able to go see some great scenic spots, but I’m not sure how many of them can compare with that view. The pictures do not even come close to doing it any justice. 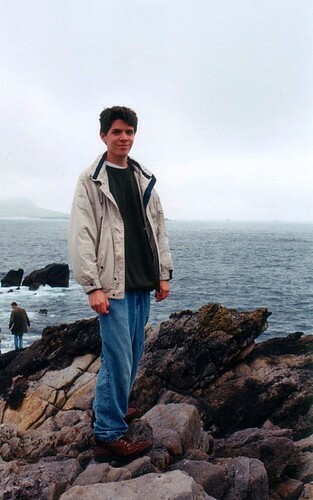 I could have spent the rest of the trip perched on that cliff, looking off into the ocean. Someone got my camera and snapped a shot of me on the rocks. This was ten years ago, so I’m much younger looking, skinnier and with no gray hair. It seems that we developed a pattern on this trip, where a small number of us would separate from the rest of the group and slow everyone down because we were always late getting back to the bus. It was like that again at this magical spot, it was hard to turn your back on this view. 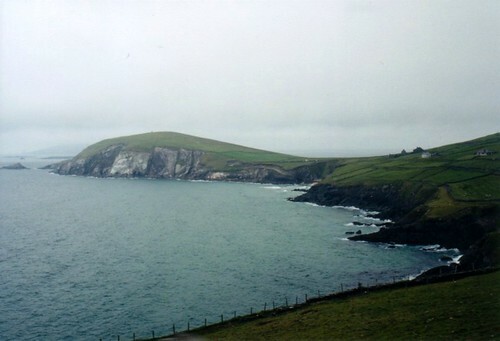 But we got back in the bus, and headed off to some more spots along the Dingle Peninsula. 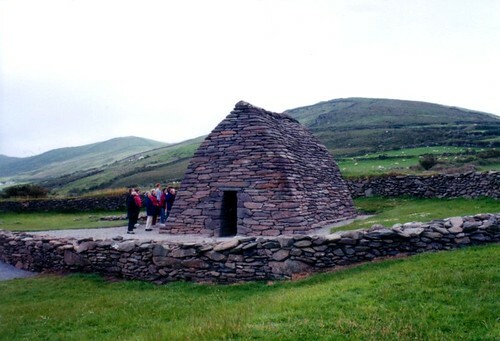 Our next stop was an old church building, called the Gallarus Oratory. Of course as soon as we drove into the nearby parking area, three other tour buses pulled up and dumped out tons of people. I heard our bus driver curse the crowds, even if we were a bus full of tourists as well. But one thing about big tour groups is that you don’t have to wait too long for them to leave. Most of them just seem content to walk around a bit, take a few pictures, ask each other what it is they are looking at, and then tromp back into the bus. After a few minutes of chaos, it was relatively quiet after that. 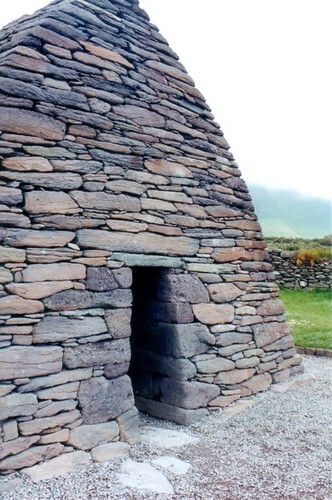 The Gallarus Oratory was built sometime between the 6th and the 9th centuries. The church wasn’t made with any mortar, yet the inside is still water tight. 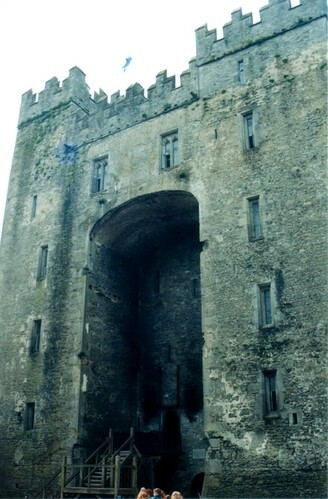 In fact the old building has stood up amazingly well after centuries of Irish weather and tourists. Again I was amazed at the history here. This building has stood for centuries, oblivious to the changes going on all around it. To this great old building, the passage of years must be like the drops of rain on the rocks. 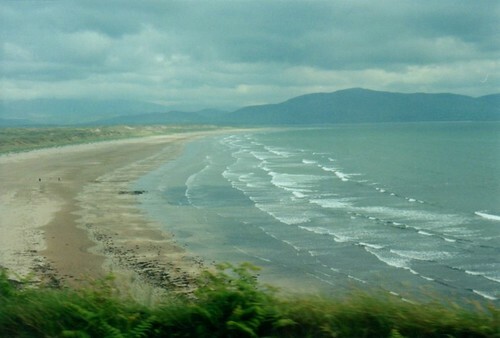 From there the bus rumbled further along, passing by this amazing view of a beach called Inch Strand. We were able to go out onto the beach, but it was cold out - not really the best weather to make a bunch of sandcastles. 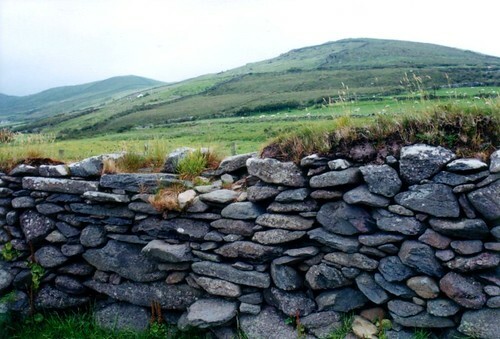 There was still a lot more things to see on the Dingle Peninsula, but our tour had come to an end. It was time for us to head back to Tralee. 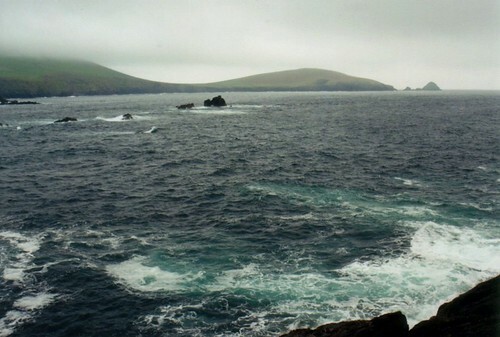 But I'm eager to head back out to the Dingle Peninsula again, it is an amazing place. 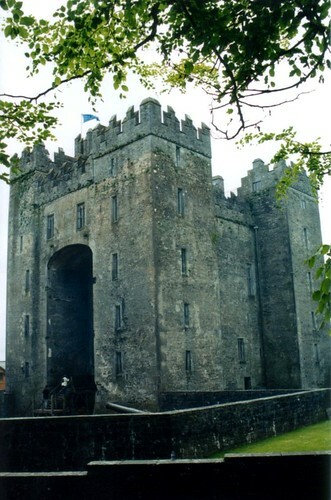 We left in the morning and made our first stop at Bunratty Castle. 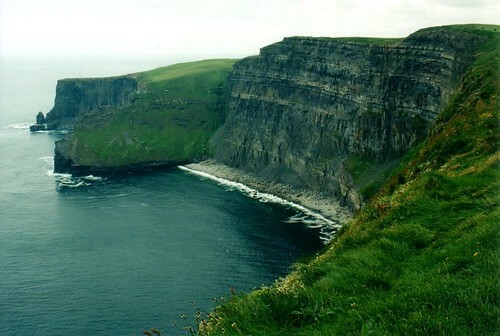 The Vikings first settled this spot, around the year 970. 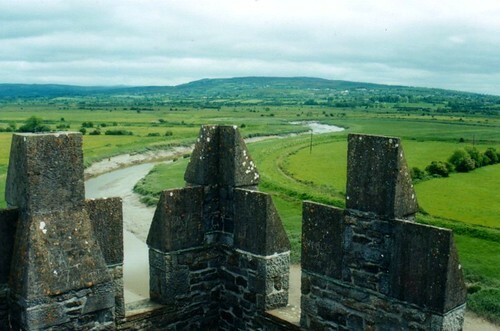 The current castle was completed around 1425. You can go in and explore the different rooms and chambers, and then head out to the top of the towers. 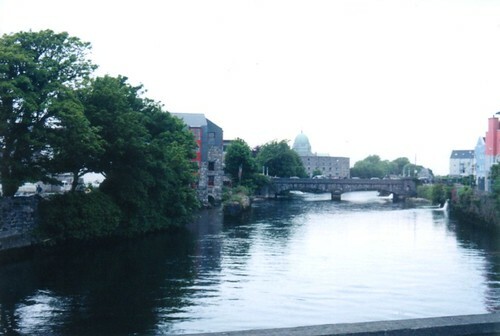 This is the view of the Ratty River (gotta love that name), which flows into the River Shannon. 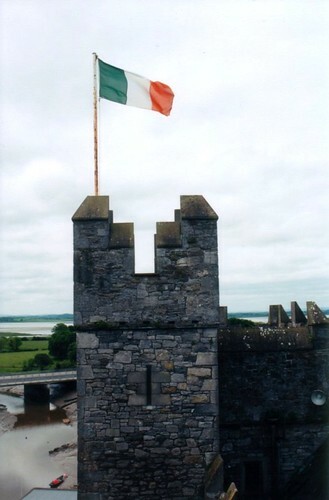 And the view of another tower, flying the Irish tricolour (another tower was flying the flag of the European Union). 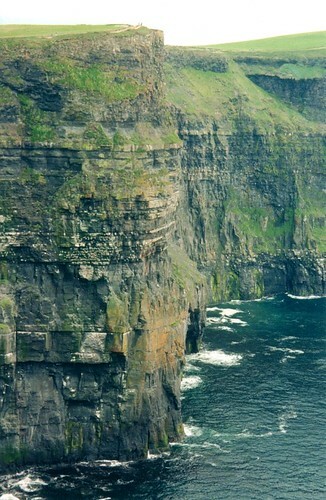 From there we headed on to the Cliffs of Moher. 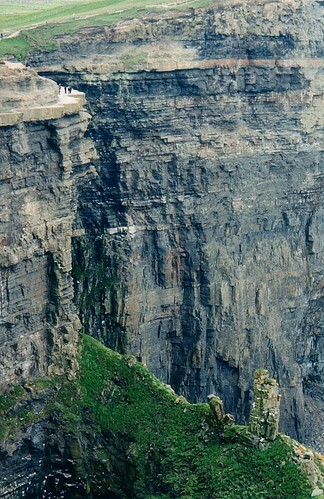 Located in County Clare, the Cliffs of Moher is another amazing spot. 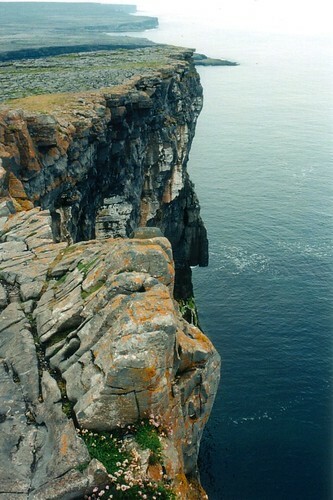 The cliffs here stand 700 feet above the Atlantic Ocean. You’re so high up that you can’t even hear the waves crashing below you. Before we stopped here, our bus driver warned us that a few tourists are “lost” every year at the cliffs. I scared myself while standing and taking pictures, I wasn’t even near the edge of the cliffs, but I slipped and stumbled some. I think my heart nearly jumped out of my chest. I didn’t bother getting too much closer to the edge after that. I took his word for it, and the three of us hurried back up the sidewalk. This was easier said than done since this was all uphill. But we finally managed to catch up with who did indeed turn out to be Bill Maher. We stopped and tried to talk to him, clearly getting on his nerves. It didn’t seem like he really wanted to be approached like this. But if you are a celebrity, and you don’t want people to recognize you, it’s probably best not to wear a jacket with the logo of your television show on it. 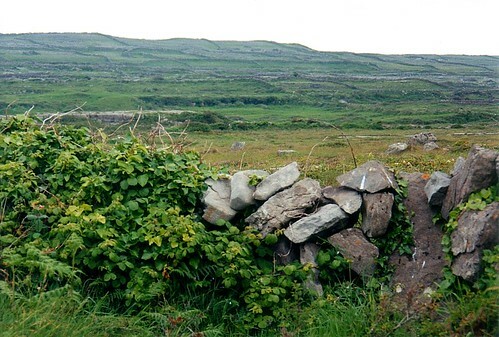 We then drove up to the north, past the eerie and forlorn landscape of The Burren. At first glance this is a desolate and rocky area. 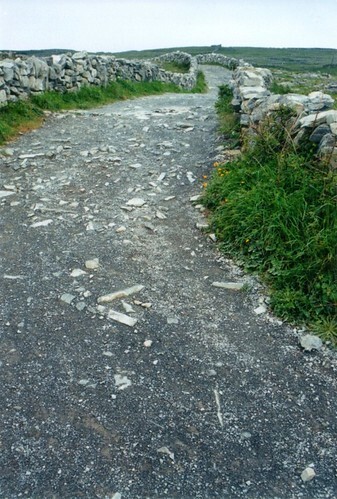 Everywhere there are massive limestone rocks, laying about like broken pieces of pavement. 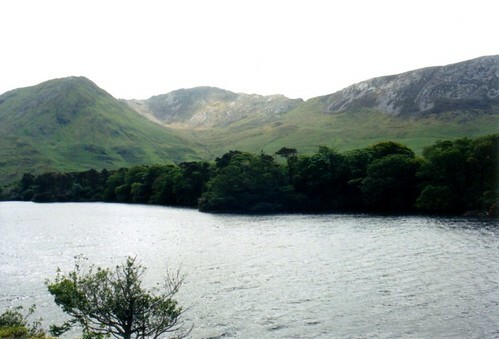 This area was famously described by the English commander Edmund Ludlow as "a country where there is not enough water to drown a man, wood enough to hang one, nor earth enough to bury him." 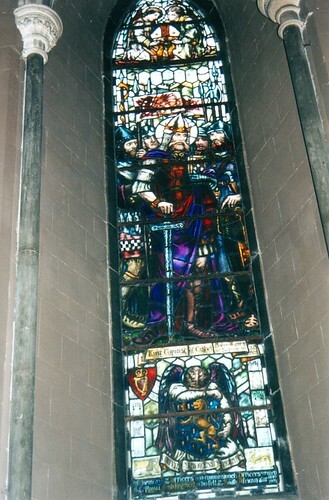 Ludlow served under Oliver Cromwell, who is perhaps one of the worst villains in Ireland's long and sad history. 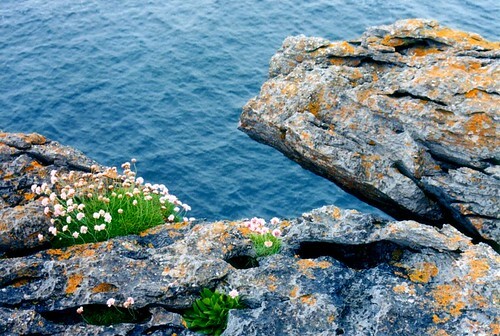 But as sparse as it looks from afar, there is life among the rocky landscape. 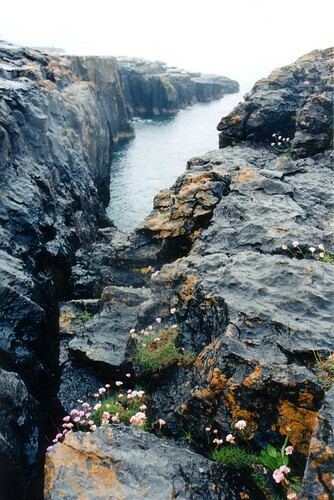 Between the limestone rocks are cracks that support a large number of plants, including arctic, alpine and Mediterranean species. 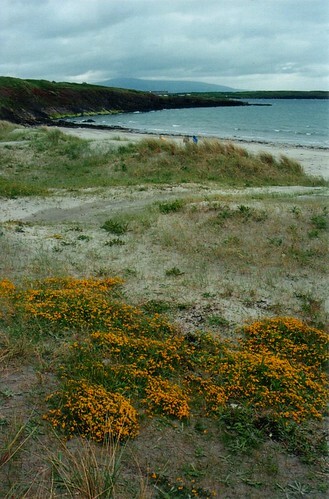 We stopped and got to explore an area right where the Burren met the waters of the Atlantic Ocean. Our next stop was Galway, and we were able to walk around some before we were taken to meet our new host families. I was excited to be in Galway, since we are able to trace our branch of the Cormack family history here. 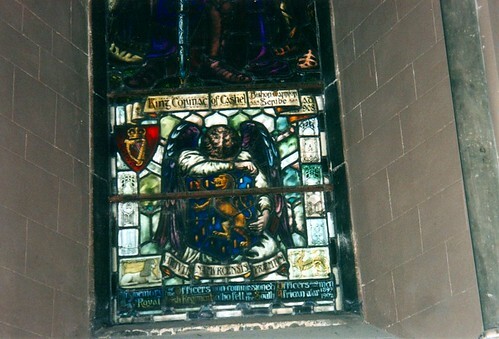 I'm the descendant of a Cormack who left Galway in the 1700s and immigrated to America. Looking back now I wish I had looked up how many Cormacks there were in the Galway phonebook. 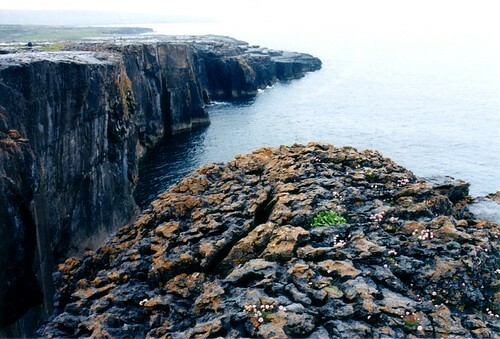 We woke up early in the morning and caught a ferry to Inishmore, the largest of the Aran Islands. 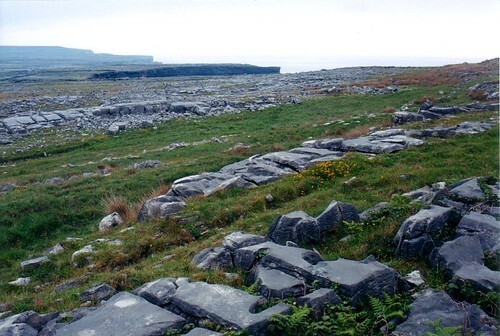 The three Aran Islands (Inishmaan, Inisheer and Inishmore) lie just off the coast of Ireland, and were once one of the most isolated places in the country. 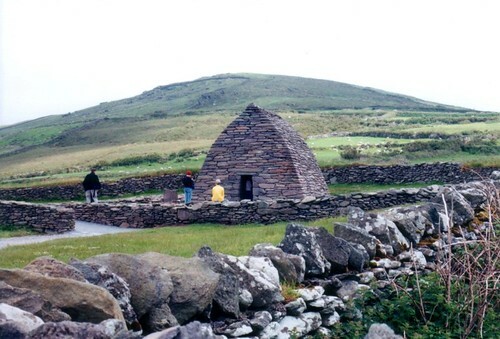 Now they are one of the most well preserved enclaves of traditional Irish culture. 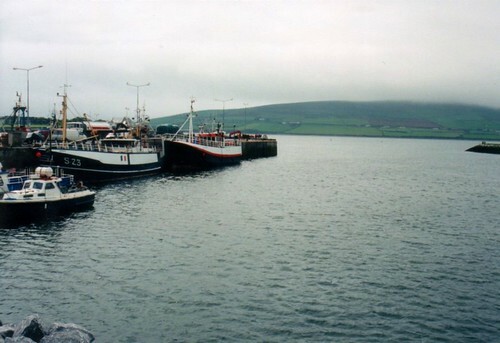 The ferry stopped at the village of Kilronan, where we would travel in a little rented van that was driven by an older local man. He was a good tour guide, he even taught us some curse words in Gaelic. 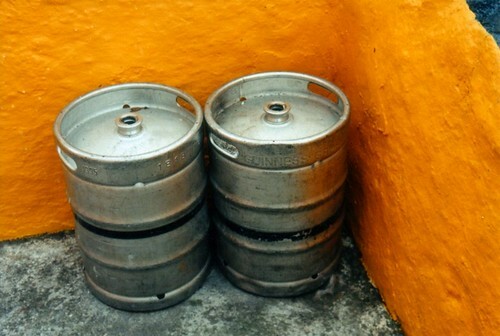 For example, Póg mo thóin means "Kiss my arse." We stopped at a few old ruins. 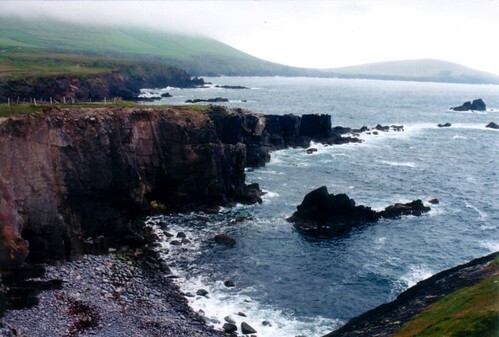 This place is Na Seacht dTeampaill, or the "Seven Churches." This used to be a monastic settlement built between the 9th and 15th centuries. 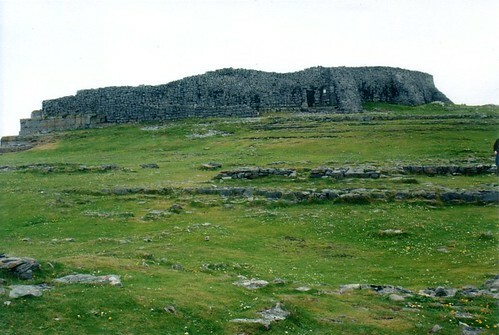 From there we traveled over to Dún Aonghasa, a fort that dates back to either the Iron or Broze Age. There probably was a fort here as early as the second century BC, and it has been called "the most magnificent barbaric monument in Europe." 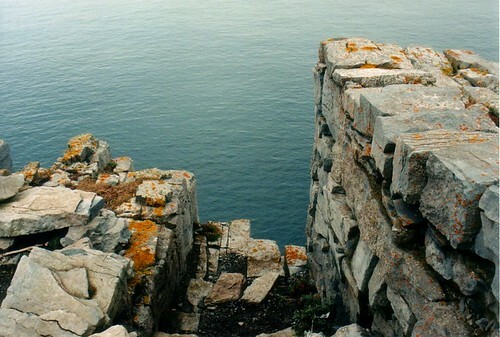 The fort sits right on a cliff that overlooks the ocean, and is made up of four concentric walls of stone. Outside of the fort is the chevaux-de-frise, a ring of stone slabs set upright in the ground that acted as a defensive measure for the fort. 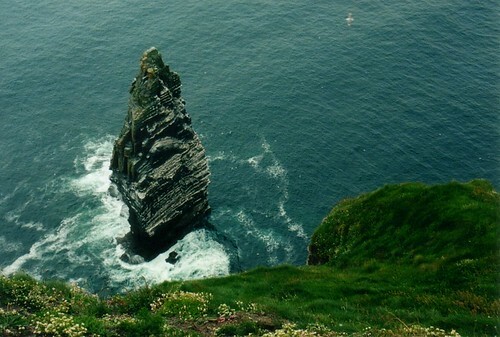 This is the view looking down at the Atlantic Ocean, from Dún Aonghasa. 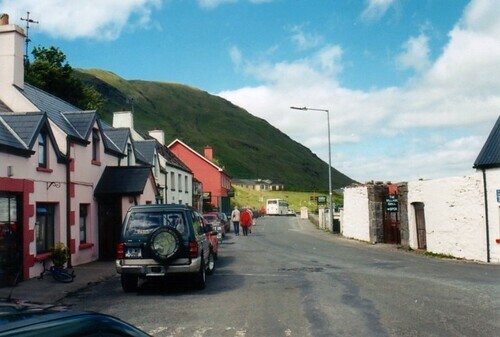 We were able to spend the rest of day walking around, and eventually made our way back to Kilronan. I saw this while walking past a few buildings on the way into town.